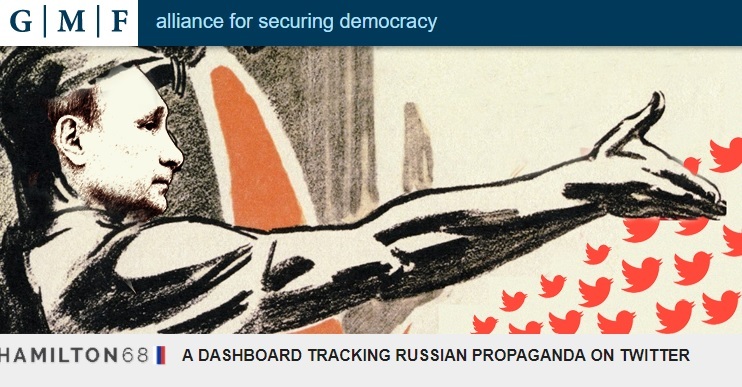 The Alliance for Securing Democracy calls itself a dashboard tracking Russian Propaganda on Twitter. But its real purpose is to smear websites supportive of Donald Trump and his accomplishments as Russian propaganda. The Advisory Council for Alliance for Securing Democracy includes several #NeverTrumpers and far left hacks including: Michael Chertoff, Bill Kristol, Michael Morell, Mike McFaul, Jake Sullivan and Nicole Wong. It is a complete bullsh*t website and we knew this the first time we saw it. USA Today wrote about this website and asked The Gateway Pundit about ranking their list of favorite Russian websites. I’m writing to seek your input for an article about a number of U.S. web sites, including The Gateway Pundit, that are included on a regular basis in tweets by a Russian network said to be spreading propaganda and disinformation useful to the Kremlin. The network of 600 Twitter accounts has been compiled by the German Marshall Fund of the United States’ Alliance for Securing Democracy under the moniker Hamilton 68 Dashboard. The Alliance says the network is a subset of thousands of accounts that amplify messages helpful to the Kremlin, with themes that highlight divisions in U.S. society and the Republican Party, and between the U.S. and its allies, with the purpose of supporting leaders that Russia considers helpful, and sowing discord and confusion and weakening Russia’s adversaries in the West. What do you think of The Gateway Pundit being portrayed as a darling of Russian propagandists? We wrote about this site. The Gateway Pundit has been under constant attack by globalists and Hillary supporting websites. The website’s real purpose is to smear websites supportive of Donald Trump and his accomplishments as Russian propaganda and to silence those who support Donald Trump. The far left understands that The Gateway Pundit was the 4th most influential right-leaning media outlet during the 2016 election and now they are trying to destroy us. Of course, we have no connection to the Russians nor have we ever had contact with any Russian officials. It is the latest conspiracy to take down Trump and those who support him. Are you denying that The Gateway Pundit (with other US right wing media) and Russian media amplify each others’ messages? The allegation is not that you or anyone at The Gateway Pundit work directly with Russian officials, but that Russians see your web site as useful for whatever reason. Do you think they have US interests in mind, how do you feel about them using your site to advance their purposes? Or do you deny that they’re doing it at all? A lot of the big stories during the 2016 campaign were based on information that US intelligence said was stolen by hackers directed by the Kremlin and provided to Wikileaks. The Gateway Pundit was one of the major propagators of those stories and its readership grew tremendously. Now GMF is documenting Russian efforts to amplify your reach through a combination of official and fake accounts. Do you agree with GMF and others that the Russians are trying to influence the American public for their own in interests? Why is that OK? Russia Today, the most influential Russian media source in the west, hosts far left anti-American pundits who have their own shows. No rightwing pundit has any say on the site. Russian media tends to cover more anti-American far left stories and elevate far left hacks significantly more than conservative Trump supporters. No proof has been released that show Russia gave the info to Wikileaks. In fact, Wikileaks founder Julian Assange has said numerous times that Russia was not the source of the leaks. Only time will tell. The far left knows that by defining Breitbart and The Gateway Pundit as “alt-right” they are making us political targets. The Gateway Pundit has been a top conservative website for years in America. As mentioned earlier, the far left understands that The Gateway Pundit was the 4th most influential right-leaning media outlet during the 2016 election and now they are trying to destroy us. By defining us as Alt-Right they are hoping we get the same beat-down and abuse as we’ve seen at dozens of Trump rallies this past year by the alt-left. Liberal reporter Glenn Greenwald tweeted yesterday on the complete fraud of Hamilton 68 and Alliance for Securing Democracy websites. They are based on anti-Trump and anti-Russia spin and nothing more. We were right. The websites are complete horsesh*t.